Oppo has launched Oppo F7 Smartphone in India with 19:9 aspect ratio display with a notch. Vivo V9 also come with similar Specs. 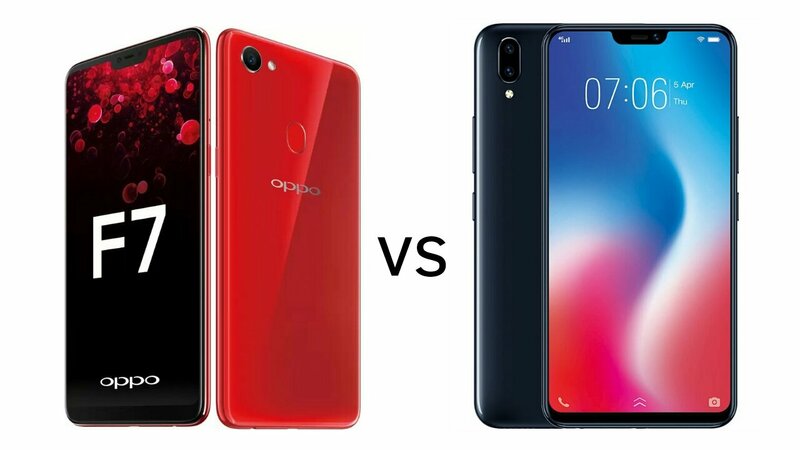 Check out Price, Specs, Features comparison between Oppo F7 and Vivo V9. Both Phones has a 6.23-inch (2280 x 1080 pixels) Full HD+ 19:9 IPS display, Fingerprint Scanner on the Rear. Oppo F7 is Powered by Octa-Core Helio P60 processor whereas Vivo V9 come with Snapdragon 626 Processor. Vivo V9 comes in Pearl Black, Champagne Gold and Sapphire Blue colors priced at Rs 22,990. OPPO F7 comes in Solar Red, Moonlight Silver colors, is priced at Rs. 21,990 and Sunrise Red variant with 6GB RAM with 128GB storage version for Rs. 26,990.